Flat Stanley Adventures Across the Country! 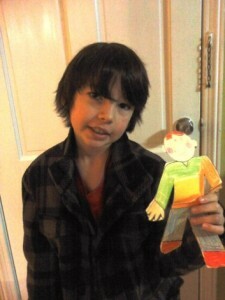 My nephew Jake had a Flat Stanley learning adventure that turned into an adventure for a lot of my friends and I too! So many people spent so much time helping Jake learn more about this incredible country of ours that I couldn’t let it be confined to a book somewhere. I really wanted to share it more broadly. So slowly I started posting them here on my blog. Its taken a long time but we’re finished! We got this all started by a simple blog post asking if anyone was willing to help me get a series of adventures together for Jake’s class & his Flat Stanley. The blog posts below provide that plea and some of the earliest thoughts around what was coming together! PLEASE…. 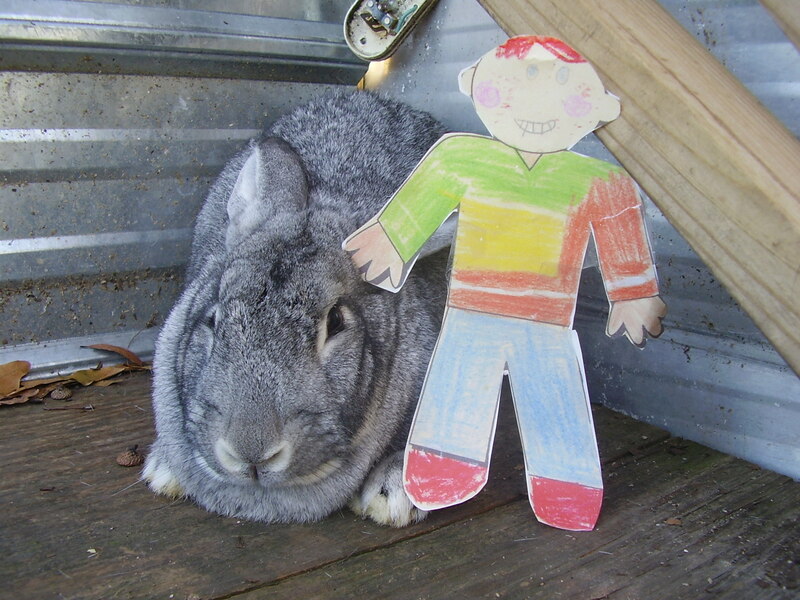 Can Flat Stanley Please Visit You? — What we do for the kids in our lives! This is one of mine…. my nephew Jake… cute kid huh? And he’s holding one of those paper dolls — a Flat Stanley — that so many kids color as part … Continue reading ? 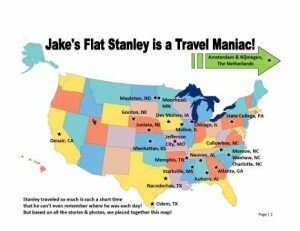 Jake’s Flat Stanley Has a Great Series of Adventures! Farm & City! — When I wrote about a nephew’s Flat Stanley project a week or two ago, I wasn’t really sure what to expect. I hoped a couple of the folks I’d gotten to know through social media would help Jake learn more … Continue reading ? A Map to Adventure! Flat Stanley Goes to Farm & City — My nephew’s Flat Stanley went on so many adventures we had to plot them on a map! 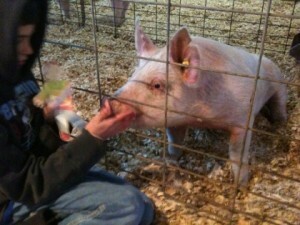 Fifteen states seeing life in the city and several farms! Continue reading ? To help you find some of the adventures that most interest you, the following list of links & intros were pulled together. Jan Hoadley of Slow Money Farm in northern Alabama — Jan has a great small farm. Its a real passion for her to help others learn about the way she does things from raising rabbits to communications. She also grows & dries herbs like rosemary and I can tell you, the aroma had to encourage Stanley to jump right in! And the photos of Stanley with her chinchilla (a type of rabbit which I recently found out even some adults didn’t realize LOL) draw you in in a way that few could possibly do! To see lots of photos and the full story of the visit with Jan, click here. Jecca Ostrander who is a RanchWife4Life and works with Box O Quarterhorses in northwest Nebraska took Flat Stanley along on chores with her son Stetson one day. She also took time to teach him about the Sand Hills and the Ogallala aquifer! Lots of photos on this one to help my nephew get the feel of a very different area of the country! Continue reading ? Debbie Lyons-Blythe lives on a Kansas cattle ranch not too far from Manhattan, Kansas. She took Stanley along one day as she was doing chores on her ranch. Doing water chores with such cold weather was made a bit easier with some sunshine. He learned about taking care of Debbie’s cattle (and soon you’ll see more ranch adventures). Continue reading ? Memphis! Take Me to the River, Sun Studio & the Peabody! — Memphis, Tennessee (644 miles from home) Welcome to Memphis, TN Ms. Rorie’s Class and Jake! Flat Stanley came to visit me in Memphis, where I am going to college to be a teacher. We went to a bunch of …Continue reading ? 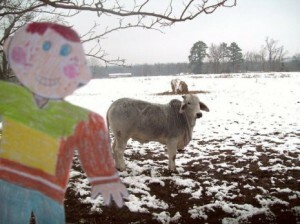 Flat Stanley Finds Out Brahmans are Big in Texas! –Nacogdoches, Texas (964 miles from home) A trip to a ranch means a lot of time outside helping with chores! That means a lot of photos of what Flat Stanley was doing while he visited MJ Brahmans in Nacogdoches, Texas. … Continue reading? First Visit to a College Campus Thanks to Nikki! — Cullowhee, North Carolina (192 miles from home) Jake and Ms. Rorie’s second grade class, I’m so happy my brother sent Flat Stanley to visit me at my college. I go to Western Carolina University in the mountains of North Carolina. First, …Continue reading ? Touring Airports & Atlanta with Flat Stanley & Farmers — Memphis, Tennessee Airport (644 miles from home), flying to Atlanta, Georgia (327 air miles from Memphis) Hey Jake, You know how much I travel for work? Well, I had a great trip recently and got to take Flat Stanley …Continue reading ? 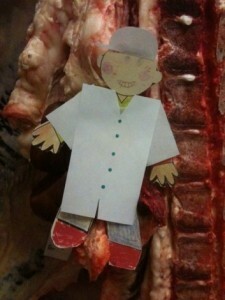 Flat Stanley Thinks & Learns About Meat Processing — State College, Pennsylvania (544 miles from home) Hey Jake! Your Flat Stanley came to visit us at Pennsylvania State University (you can see him in the photo here with our legendary football coach Joe Paterno who we sometimes call JoePa). … Continue reading ? Snow & Farm Equipment in Moorhead, Minnesota: A Flat Stanley Adventure — Moorhead, Minnesota (1,411 miles from home) Flat Stanley sure was a long way from home visiting up here with me in Minnesota. We’re next to the Red River in the Red River Valley and the land around here – both in … Continue reading ? Flat Stanley Visited Auburn, Alabama the Best Week Possible ! — Auburn, AL (377 miles from home) Hi Jake and Ms. Rorie’s Class, Flat Stanley came to visit me in Auburn right before Auburn University played in the BCS National Championship Football game. He wanted to take his picture with the …Continue reading ? City Days of Burgers, Roller Derby & Wrestling in Memphis — Memphis, Tennessee (644 miles from home) Hey Jake! This is probably going to be one of the pages that you may get excited about cause Flat Stanley, Alicia and Janice all went to Huey’s with a big group of friends … Continue reading ? Snowstorms, Soybean Seed & Kool-Aid’s Birthplace — Flat Stanley in Nebraska — Juniata, Nebraska (1,279 miles from home) Flat Stanley had quite a time while here in Juniata, NE. Weeks Farms is located in the South Central part of Nebraska. We have a large swing in climate during the year. In the … Continue reading ? Checking Out Chicago & Snowmobile Racing — A Flat Stanley Adventure — Chicago, Illinois (773 miles from home) Jake, I sent your Flat Stanley with my business partner to Chicago. I hope you are getting a lot of emails about where he has been. Flat Stanley stopped by Comiskey Park in Chicago to … Continue reading ? 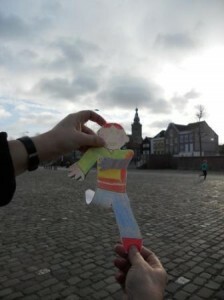 Stanley Goes To The Netherlands with Jake’s Nannae — Nijmegean, The Netherlands (4,157 miles from home) Hey Jake, Flat Stanley went on a trip to the Netherlands or Holland with me. The Netherlands is in Europe. I have been here before, but I don’t think Flat Stanley has. We …Continue reading ? Stark Vegas Fun for Flat Stanley — Starkville, Mississippi (557 miles from home) Hey Jake, (Cowboy with Flat Stanley – Cheeeeeese!) We were so excited when Flat Stanley arrived in Starkville, Mississippi – home of the Mississippi State University Bulldogs! Starkville, also affectionately known as Stark Vegas, … Continue reading ? Spending the Day in the Fifth Grade — Denair, California (2,642 miles from home) Hey Jake, On Thursday January 12th 2010 I took flat Stanley to school with me at Denair Elementary School. We read the book “The series of the unfortunate events” together. Stanley enjoyed the book because … Continue reading ? South Texas Farmers Show Flat Stanley Around — Odem & Corpus Christi, Texas (1,258 miles from home) Dear Jake and the rest of Ms. Rorie’s class, We were thrilled Flat Stanley could come for a visit to Odem, Texas. About 2,500 people live in Odem. It is a … Continue reading ? Winter in North Dakota = School, Wrestling & Snow for Flat Stanley — Mapleton, ND (1,424 miles from home) Jake, My name is Gwen and I have two sons (Gunnar age 8 and Colton age 5). We live in Mapleton, ND. I have added a few pictures of one of the events Flat … Continue reading ? Flat Stanley Sees Inside John Deere’s Factory — Des Moines, Iowa (1,064 miles from home) Moline, Illinois (a 172 miles from Des Moines) Hello Jake, Flat Stanley came to see me at the factory where we build Cotton Pickers and Sprayers in Iowa. He couldn’t go out on … Continue reading ? Flat Stanley Visits the Missouri State Capitol! — Jefferson City, Missouri (848 miles from home) Hey Jake and Ms. Rorie’s Class! 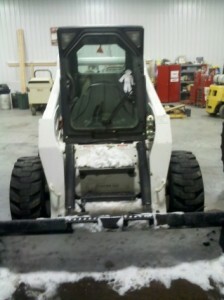 Thought you would like to see Flat Stanley having fun in the snow here in Missouri this week. He really enjoyed the white, fluffy stuff but he … Continue reading ? Flat Stanley Cooks Pizza & Helps Make a Snowman — Waxhaw/Charlotte, North Carolina(25 miles from home) — The other day Flat Stanley came along with me to work at Brixx Wood Fired Pizza in Charlotte. You can see Flat Stanley helped to cook the pizzas. First, he helped to look in on the pizzas while they cook in the large brick oven. You can see the wood and gas flames we use to cook our pizzas. Continue reading? Jake wanted to tell everyone thank you. so he wrote this great letter to all the folks who hosted Flat Stanley & sent back stories of the adventures he went on! Thank you very much for helping us do the Flat Stanley Project. It was very cool and fun. I know Flat Stanley had a good time thanks to all you nice people. My teacher, Ms. Rorie, put my Flat Stanley book in the front case at school, that’s how much they liked it!!! Jake’s book was pulled as being one of the best in the school and they’ve put it in a display case at the front of the school for a while! (He used THREE exclamation points for that!) He also told me that during the time when everyone in the class was able to look at other kids books, his was the one that got the most attention from several kids. He said that a lot of his classmates didn’t know that his family knew so many farmers but he knew I did! LOL! 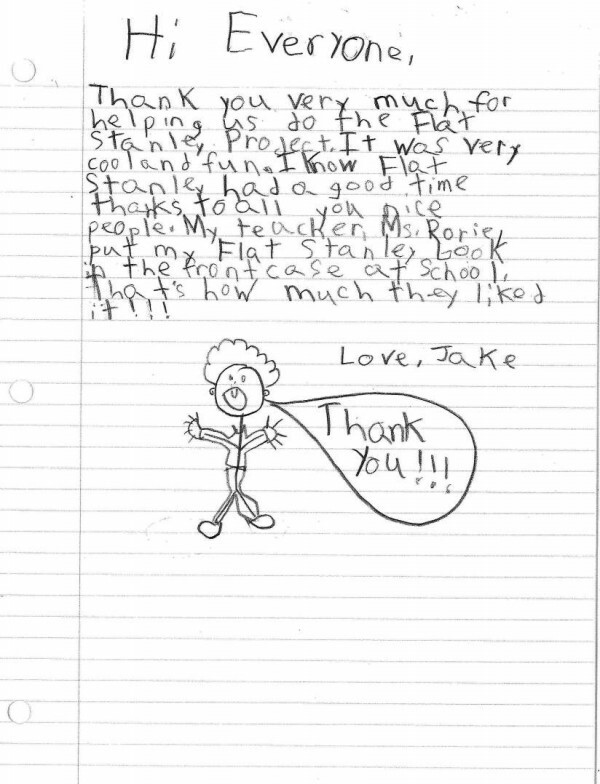 It doesn’t feel like saying thanks is enough for all the people who have come together to help Jake’s class learn about so many different places and activities! No doubt, the stories will shape his world for years to come!